After a successful start of the second decade of the Balkan Entertainment & Gaming Exhibition (BEGE), the organizers of the event which unites the gaming industry in the region promise the most exclusive and exciting trade show of 2019. 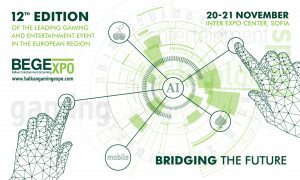 The 12th edition of the exhibition is scheduled for 20 – 21 November and it is going to set new standards for the future of gaming for the next year. The exhibition already enjoys huge interest from many of the best-known brands in the industry. If you are still considering your place as exhibitor, now is the time to move ahead and reserve space for this unique event. The record breaking show in 2018 welcomed in excess of 80 exhibitors and over 5000 visitors from 53 countries. The biggest industry leaders and new emerging gaming companies descended on Sofia, Bulgaria to present new trends and developments in the sector. Among the exhibitors list could be found the names of: Novomatic, Ainsworth, Casino Technology, EGT, Suzohapp, BetConstruct, Digitain, Interblock, Merkur Gaming, APEX, Alfastreet Trade BG, IGT, Innovative Technology, Alfastreet Gaming Instruments, Abbiati, Industrias Lorenzo, Fininvest d.o.o., JCM Global, Kajot, Advansys, Zitro, UltraPlay and many more. During BEGE the 4th edition of the most contested competition Gaming StartUp Challenge 4.0 will go under the slogan “Roadmap to Success” this is going to provide an extraordinary opportunity for startups – not only to position themselves on the global gaming industry map but also to be recognized by the leaders in the field. Special “StartUp Zone” will allow other companies with interest in the industry to join the exhibition and during the contest which will take part on the second day 21st of November to present their project / product or service in front of a huge audience. In 2018 during the 3rd edition of the competition technology companies and entrepreneurs have presented their presentations in the field of sports betting, blockchain and gamification solutions, VR technologies, PC-mobile cross-platform online gaming platforms and a number of software solutions. Currently all start-ups from the gaming and entertainment field can apply for taking part in the Startup zone and participation in the Gaming Startup Challenge – 4.0 by contacting the organizers. Specially selected accompanying events will further endorse your interest in 2019. BEGE Awards will come with more glamour and excitement than ever to honor individuals and companies for significant contribution and outstanding achievements in the gaming, entertainment and leisure Industries. Once again, the official Award ceremony will be held during the annual epic BEGE Party. The Eastern European Gaming Summit (ЕЕGS) is also set to reveal a refreshed conference format on 19 – 20 November which keeps you on track with the latest regulatory and technological developments in Eastern Europe. The event gathers 200+ industry representatives from 22 countries, helping them gain in-depth knowledge about vital updates and legal cases from top-level industry experts. Vital topics, round table discussions and Networking zone are among the features that the regional gaming forum prepares for its 12th edition. The application is open now and proposals for session moderators, panel speakers, topics or presentations are welcomed. To keep ahead of the field and learn more of the latest trends in the gaming and entertainment industry, present and expand your business then mark the dates in your calendar now for BEGE and EEGS 2019!